This large, spacious home is ideal for a family gathering. Peek a boo views from the front porch lead you into an open floor plan. It is a short walk to the beach access at 6th Street and into downtown Cayucos. The living room has ample seating, and a 45" Flatscreen TV. The kitchen is fully stocked and has an electric stove and oven. There are several skylights strategically placed thoughout the home. Enjoy a wonderful selection of original art. All 3 bedrooms are on the first level. Bedroom #1 has a Cal King, bedroom #2 has a Standard King, and bedroom #3 has two Twin beds. In the bonus room upstairs there is a wet bar, a 32" flatscreen TV and a pull out queen sofa bed. 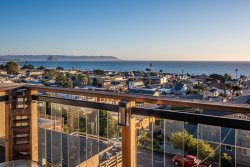 There is a very large deck off the bonus room with fabulous ocean views! Wonderful and beautiful people. So very helpful.